Want to get more comfortable with managed futures before committing capital? 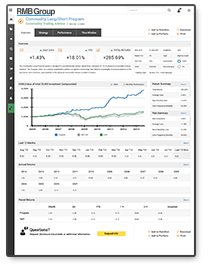 Take a “test drive” and receive the actual track record of one or more of our CTA portfolio managers. Dozens more are available at your request – and no obligation. A specialist at RMB will specifically pick CTA portfolio managers to best fit your investing needs. By seeing how they perform you’ll get a better idea of what investing in managed futures is all about. Fill out the form and one of our representatives will be in contact with you shortly.